This book reminds me of Sri Lanka’s 2015 presidential election when Mahinda Rajapaksa was defeated by a man he described as a ‘clerk.’ Similarly, Hillary Clinton was favoured by the bookies but defeated by showman Donald Trump. Rajapaksa amended the constitution to accommodate him for life if necessary and assumed he could not be defeated. For did he not defeat the LTTE? Winston Churchill – a great war leader – also thought he could not be defeated but the British voters threw him out following World War II. Having lost to Barack Obama, Clinton accepted the post of Secretary of State in his administration and bided her time till she announced her decision to run for the presidency. But the shadow of Benghazi where US diplomats were killed and using her private email for official matters haunted Clinton throughout her campaign. Then there was ex-president Bill Clinton who was keen to return to the White House although not as commander-in-chief. He was busy raising funds for his wife whom Wall Street bankers had no qualms about supporting. But the embarrassing episodes that dogged the second term of his presidency weren’t forgotten. Bernie Sanders – a last-minute candidate – gave Hillary a good run initially. His success in the preliminaries worried Clinton but Sanders demonstrated his naivety by playing into her hands by saying the email issue did not worry him. And Sanders spoke of an hourly minimum wage of US$ 15. Similarly in Sri Lanka, the UNP discussed raising wages of public servants by Rs. 10,000 a month. While Sanders said he would offer free university education, he also claimed he was a democratic socialist and against capitalists, which rattled the Democrats. Clinton was distrusted because she was perceived as a liar and shown to be indignant without being contrite. In the meantime, black voters were another factor – they were annoyed because she was the white woman who had stood against Obama in 2008. The similarities of this with the votes of Muslims and Tamils going against Rajapaksa in 2015 come to mind. If Sanders was a strong candidate initially, what caused him to fail? 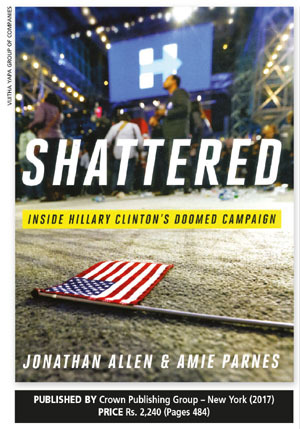 The authors detail the various steps taken by Clinton and her team to crush him. The insider details of that campaign and tactics they used will be an eye-opener for many. The American system is built on the electoral college system in contrast to the representative system in Sri Lanka. The book contains lessons for us in its analysis of the methods used in the US to capture votes and rattle the contender, while the use of mainstream and social media had their impact in Sri Lanka too. It also details how clever managers made maximum use of available funds although it also meant that there were jittery moments for her campaigners who were uncertain whether they would retain their jobs. Meanwhile, many donated with an eye on the future because of the benefits they expected. Is this not the same in Sri Lanka where funding is offered because recouping the money is anticipated when one’s candidate wins? Hillary Clinton was a taskmaster and reacted against her staff on many occasions, vexed by her campaign’s imperfections. In attempting to woo the blacks and minorities, she angered her base voters – the whites who had voted for her. In Sri Lanka, the minorities were ignored in the battle for the minds and votes of the majority Sinhalese community. This was clear in district-wise voting patterns. Many in Clinton’s camp felt she was the issue but none had the guts to tell her so. Having been at the receiving end of Trump’s jabs, she began to take jabs at him too. “When we hear a candidate for president call for rounding up 12 million immigrants… banning all Muslims from entering the US, that doesn’t make him strong – it makes him wrong,” she thundered. She went on to say they were “racist, sexist, homophobic, xenophobic and Islamophobic,” and added that they were “irredeemable.” This angered many who felt she sounded elitist. And her bout of pneumonia soon after made many wonder whether she was strong enough to be president. External forces created a storm that wiped her out. But the fact is that Clinton was unable to prove that she had a vision for the country rather than visions of power. The Rajapaksas proved the same: power was more important than a vision for the nation.